We are at the end of the first year of 4-years term of presidency. Let’s summarize the obtained results and ongoing actions with the aim to outline future plans and actions for completing our goals for the ‘activity and visibility’ program. (current WG’s for 2009: Revision and evaluation of TCs, IFToMM flyer and posters, Differentiated conference fee, IFToMM sponsorship, New IFToMM membership, IFToMM Newsletter, EC Regulations, IFToMM Jnl on gears, Material for presentation of IFToMM, New conference initiatives, Summer schools and tutorials on MMS, Presidency desk). We still need to work on how to improve the visibility of existing IFToMM activity and to increase activity by TCs and PCs and by IFToMM Community at large. As already discussed, in order to achieve those goals we need also to identify and stress benefits for individuals and institutions (including MOs themselves) that will stimulate their actions in IFToMM with new and larger initiatives (conferences, meetings, editorial initiatives, etc.). At the moment, after some recent developments we can advertise as benefits in being in IFToMM the following main aspects: access to IFToMM activity with reduced fees, international contacts among individuals and institutions, participation and contribution to IFToMM activity. Perhaps, you have additional ideas that can contribute to attract more and better interest to IFToMM and to its activity, and it will be very welcomed to discuss them in due course but also at the next 2009 EC meeting. Activity can still be easily increased by just bringing existing initiatives on MMS topics under the IFToMM umbrella and through a well-identified influential participation of the IFToMM community. Of course, new initiatives are necessary and welcomed, mainly to stress an active role of TCs. They can get the IFToMM support, beside a patronage by IFToMM, whenever they come from PCs and TCs or MOs, but even from individuals affiliated to IFToMM MOs. Nevertheless, I will encourage for better visibility that benefits should be clear and well understood so that being proud to be in IFToMM any individual can participate or initiate activity with convenient awareness of the IFToMM significance. Thus, we still need a certain promotion and advertising activity even within IFToMM community by all of us in any occasion (personal contacts, meetings, conferences, etc.) for this you may use the flyer and posters that you can find posted in the IFToMM webpage. I thank you for the attention, and I remain at your disposition. I wish you an happy end of the year 2008 and a very prosperous 2009. Similar to previous years, the IFToMM webpage ( www.IFToMM.org) continued to expand in 2008. Please refer to the Site Map for a summary of the content. The new additions include the following. Internal Reports page which is a repository for internal/confidential reports and documents shared with the IFToMM Officers (Executive Council members and chairs of Member Organizations, Permanent Commissions and Technical Committees). Membership composition of Executive Councils since 1969; posted on the About IFToMM page. Recipients of Young Delegates Assistance since 2004; available from the Young Delegates Program page. If your Member Organization, Permanent Commission or Technical Committee (MO, PC, TC) has recently developed a webpage or changed the URL for their webpage, please email me the pertinent information and I will post or update them on the Links page. As well, if your MO, PC, or TC is organizing a conference and/or workshop, please note that all the requests for posting the conference/workshop announcements on the IFToMM webpage should be approved by the IFToMM Executive Council. The list of requests is generally discussed and approved during the annual EC meeting, so please submit your applications as early as possible. The sponsorship application form for the conferences and workshops is available from the Conferences and Sponsorship page of the IFToMM webpage. Professor James Trevelyan, a member of IFToMM EC, has been continuing his contributions to the IFToMM webpage by maintaining the database he developed for the IFToMM officers and members in 2006. The latest version of all officers and members (affiliations, contact info with emails protected, and photos) are available from the IFToMM page. If your photo is not included there please forward a head and shoulders photo to Dr. Trevelyan. The IFToMM Newsletter has the capacity to become one of the key means to maintain communications for promoting research and development in the field of machines and mechanisms internationally. This year, I took the initiative of sending an invitation to the members of the IFToMM PC for the History of Mechanism and Machine Science to submit entries for the Newsletter on the historical development and applications of machines/mechanisms (e.g., interesting mechanisms and/or their past/current interesting applications). I would like to extend the invitation to all members of PCs and TCs to submit entries for the 2009 issue of the Newsletter. The success of Newsletter and initiatives related to the Newsletter is highly dependent on the IFToMM officers and members. I thank all IFToMM officers/members who contributed to this issue of the Newsletter, and I look forward to receiving your contributions for the 2009 issue (as a WORD document or in PDF format). Please note that the contributions are published in any of the four IFToMM official languages, English, French, German, and Russian. Contributions submitted in official languages other than English are expected to be accompanied by an English abstract. Some EC Members, Chairs of PCs and TCs, and Prof. Takanishi, host of the 41th IFToMM EC meeting. The 41th IFToMM Executive Council Meeting was held in Tokyo, Japan, on the 5th of July 2008 at Waseda University, the site for ROMANSY 2008. The status and problems of IFToMM activity were discussed resulting in a full agenda. Many of the main points of discussion were related to reports of activity by Permanent Commissions (PCs) and Technical Committees (TCs), reports of the EC Working Groups (WGs), the Treasurer’s report, and the report of the Organizing Committee for the 13th IFToMM World Congress. Unfortunately, and after voting, The EC decided that three reports (two PCs and one TC) should be suspended because these were sent after the deadline. This point will be included in the EC regulations, namely, “reports received after a given deadline will be suspended”. The Secretary General Prof López-Cajún reported on the business and correspondence of IFToMM. In particular, he managed two email postal ballots among the EC members, namely, for appointing of Prof. A. K. Ananthasuresh, Chair of the TC for Micromachines, and also for the updated of the MoU with Elsevier. These matters required decisions and actions before the annual meeting. He also reported as Chair of three WGs. Dr. Angeles, Chair of the WG for IFToMM templates presented the proposed templates for IFToMM conferences for both, WORD and LaTeX.. After discussion and observations, the templates were approved, subjected to further corrections. These templates should be used for all IFToMM conferences, and will be available at the IFToMM webpage. During the EC meeting several problems remained unsolved and some specific ones arose. Thus, it was decided to continue with some WGs and the establishment of new ones that will report to the next Executive Council Meeting. The WGs are: Revision and evaluation of TCs, IFToMM flyer and posters, differentiated conference fee, IFToMM sponsorship, new IFToMM membership, IFToMM Newsletter, EC Regulations, IFToMM J. on Gears, Material for presentation of IFToMM, new conference initiatives, Summer Schools and tutorials on MMS, Presidency desk. The treasurer’s report detailed the financial status of IFToMM by stressing still some problems that are related to arrears due to some member organizations. Prof. Ricardo Chicurel Uziel, Chair of the Mexican Organizing Committee for the 13th IFToMM World Congress, sent his report on the organization and Call for Papers for a successful congress. This will be held in Guanajuato, Mexico from the 19th to the 25th of June 2011. 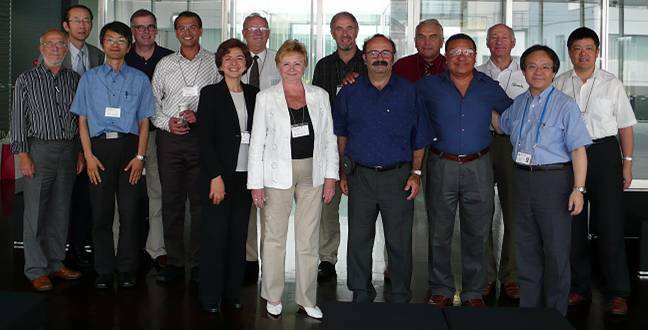 The next meeting of the IFToMM Executive Council has been scheduled for June 24 and 25, 2009 at the University of Guanajuato during the visit of the EC members. The minutes of the 41th EC meeting, and the corresponding appendices are available for public consultation on the IFToMM webpage www.iftomm.org.